In this Stamp Carving class Louise will cover the 'Basics' and 'Beyond'. Cost is $50.00 [kit included]. Included are some of the sample projects featuring the sample stamps that Louise carved for demonstration in this class. They are at the shop if you would like to take a closer look. Please Bring: Basic Kit Plus; wet wipes, paper towel, Stanley knife, black ink pad. If you have you have your own preferred carving tools then please do bring them along to class. To close out the day is perhaps Louise's fave class for the day, 'Abstract Landscapes', from monoprinted pages to the canvas! This class will begin at 1.30 until 4.00, but may stretch out to 4.30. This costing is indicative of having enough materials to create numerous paper 'art prints', and 2 canvases (not the same size as the large sample in store). Please Bring: Basic Kit Plus; wet wipes, paper towel, heat tool, Brayer, Foam roller 3" x 2, an assortment of your favourite paint brushes and palette knifes. If you have your own Gel Printing plate then please do bring this along. At the shop on display is a large canvas and several framed prints class samples, if you would like to take a look, [and a few close ups photos below]. Please take note of the "Please Bring" lists, as this is a big weekend creatively for Jane and Natalie in Brisbane, there may not be the supplies at hand in the workshop for you to use. Please do not hesitate to ask if you have any questions re these classes! Come and create with Nat and bring your Big Shot of Cuttlebug. 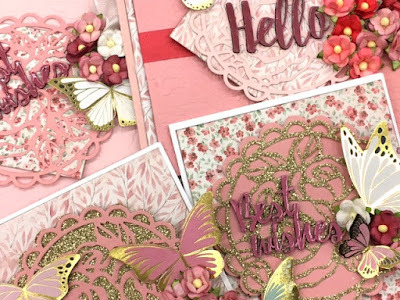 Create a gorgeous set of cards and impress your friends and family. Bring your plates and embossing folders with you. Picture as a sample only. Learn to Create from a Simple Design. MUST bring photos to this class. If you would like to come join me please do call the shop on 08 8277 1298 to book in. Another fantastic double Project Life layout designed by Karyn. This month she's used Echo Park's "Just be You" Collection. Echo Park's "Just be You" paper collection. I would like to share with you information regarding my June Long Weekend classes. There will be 3 classes over the Friday evening and all day Saturday 9th-10th. First Up Friday evening from 7.00-9.30, is a 3 layout Scrapbooking class - a little bit of Stencil Art with a Touch of Gold :) :) :) This class cost is $45.00 [kit included]. Next up is a full day of creative Mixed Media Fun on the Saturday. Starting at 9.30 until12.00 [but may stretch out to 12.30] is the Stamp Carving class. I will cover the 'Basics' and 'Beyond'. This class cost is $50.00 [kit included]. I have included some of the sample projects below featuring the sample stamps that I have carved for demonstration in this class. They are at the shop if you would like to take a closer look. Class requirements include: Basic Kit Plus; wet wipes, paper towel, Stanley knife, black ink pad. If you have you have your own preferred carving tools then please do bring them along to class. To close out the day is perhaps my fave class for the day, 'Abstract Landscapes', from monoprinted pages to the canvas! This class will begin at 1.30 until 4.00, but may stretch out to 4.30. This class cost is $55.00 [kit included]. This costing is indicative of having enough materials to create numerous paper 'art prints', and 2 canvases. Class requirements include: Basic Kit Plus; wet wipes, paper towel, heat tool, Brayer, Foam roller 3" x 2, an assortment of your favourite paint brushes and palette knifes. If you have your own Gel Printing plate then please do bring this along. Please take note of class requirements, as this is a big weekend creatively for Jane and Natalie in Brisbane, there may not be the supplies at hand in the workshop for you to use. Cheers for now, please do not hesitate to ask if you have any questions re these classes! 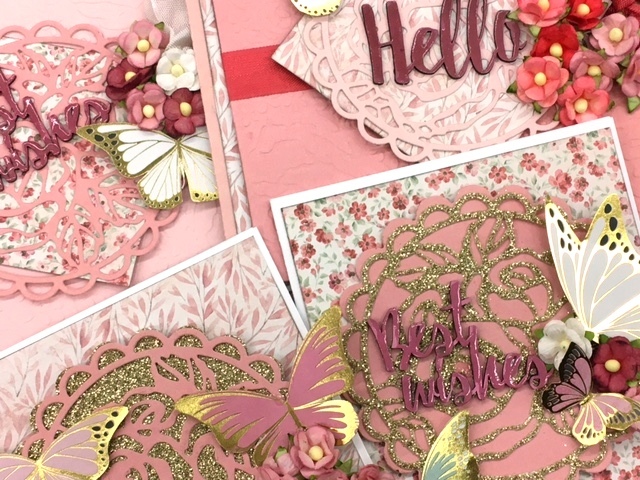 Join Jane to create a magnificent layout and card using 49&Market Print Papers. (Sorry, no sneak peek of the card) You'll be experimenting with lots of watercolour techniques in the background plus shading/adding depth around the elements on the page. Kit includes a paintbrush & all surface pencil. Join Nat to create a fantastic layout using Graphic 45's 'Nature's Sketchbook' Print Papers and some mixed media techniques. Denise has more of her very special cards planned for this workshop.